Home Fitness Why My Half-Marathon Debut Was Extra Special ! Last May, I sat holed up in my room, looking out the window at the unswaying trees and trying to make sense of my life. I felt dry and spiritless like the summer heat. I didn’t feel like climbing out of my bed in the morning, I no longer had a workplace to go to and I didn’t have the desire to put my time to use. My mind was aware of the lacunae but invariably refused to fill them up. AND when I started getting tired of myself I finally made a decision. I was going to run. If there’s one ‘Aha’ moment on Facebook that I want to talk of it was when I chanced upon the page of the running group PCMC Runners. I got in touch with one of the admins of the group and went for their training session the next day at a location closest to me. That seemed pretty easy- finding a running group and joining it. What wasn’t easy though was being consistent at the running and training activities day after day after day. However, everything started changing, albeit slowly. With each passing day (and soon month) the lethargy crumpled, the languidness vanished and the imbalance (of body and mind) lessened. All around there were people – young and old, male and female- who were enthusiastic, innervated and accommodative. Conversations revolved around goals, productivity, mileage and form. Consequently, I felt infected with the energy, did a hippety-hop out of the bed each morning and began taking baby steps towards a transformation. Soon, I did my first 5 k in July, first 10 k in October and a couple of local events. Now, I’d never contemplated doing a half-marathon. Running a marathon was never on my bucket list! But when the bug bites there’s no looking back. I mentioned in passing to a few running friends that I want to do the first HM in March. “Ha to karenge. You tell me when you want to do it.” Everyone seemed ready, except me! Running milestones are special and I wanted mine to be extra special for myself. Most, almost all, runners do a debut 21.1 km at an event – there are so many happening around us all the time. There’s absolutely nothing wrong about it, mind you. But, no fancy event and no fluff. Just a ruminant thought – running the maiden HM with the group of people who had been instrumental in my journey till here. Honestly, I didn’t want it any other way. After much discussion and might I add overthinking the date was set at 24th March. A female runner & podium finisher Nutan agreed to pace for the run. Based on the running stats we mutually agreed that 2:15 would be an achievable timing leaving a scope of improvement for future runs. As for the route it remained unplanned till the morning of 24th . Two days before the D-day I sent a message on the Whatsapp group with the time & venue details, asking others to join in (the more the merrier!). Someone then started a list of people interested in joining the Sunday run. It soon grew quite fast (beyond my expectations) with more and more people keen on running the distance in a group. On the afternoon of 23rd March I dropped a message to a running friend. It read this. “I am getting nightmares. I dreamt 1. I am getting late. 2. I am running slowly. 3. No one is there.” Reply? “You are doing absolutely normal. This is performance anxiety.” Admittedly, it was anxiety! Relatable, right? The morning of 24th thankfully dawned into a cool day with a crisp breeze. There were less of those butterflies in the stomach and more of the first-HM excitement. The big day was here! So many people turned up at the venue- some to join the run for all the 21.1 kms, some ready for a distance of their own choice, some out of sheer support, and the females to endorse a female runner. Here is a picture of us at the pseudo-start line. As the sun rose above the many fields enroute (unplanned, of course) I found a new stride of gaiety amongst the group with superb pacing by two fellow runners- Nutan & Amit. With a water break every 20 minutes or so we crossed the 5 k and 10 k mark smoothly. A snack bar after the first 10 kms , 2 walk breaks between the 15 k and 21 k mark , and a sprint (4:36 minutes/km pace) for the last 100 m and we managed to finish strongly in 2:14:25 hours amidst loud cheering by the members. Happily though, I was not alone in concluding with a personal best record. It was PBs all the way for the entire group. It was the first HM for Gaurav too, a fellow group runner. 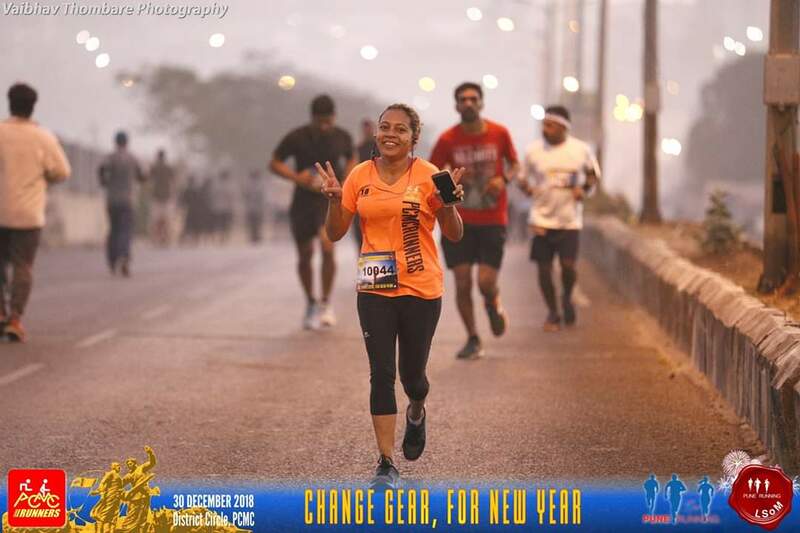 Amruta, a beginner said she was able to run her 10 km without walking. Deepak, an advanced runner and cyclist, started barefoot runs that day and many others finished the run strongly. Post-run samosas were sponsored by a very kind and humble being – a doctor by profession and a half-marathoner himself. This excitement converted into a revelry of colours as we celebrated a belated Holi. Here are a few group pictures of us dabbling in the many colours of joy and satisfaction. What started as ‘my debut half-marathon’ had turned into one mega group run with runners coming out to support, cheer, click pictures and arrange hydration & breakfast while making tons of memories. It was a superb show of solidarity for a runner by the runners and a lesson in kindness and spirit for me. With Holi colours in my hair, a sense of achievement and a happiness stupor I was left grinning stupidly from ear to ear for the rest of the day! While last May was dreary, this May I intend to keep burning the spirit of running within and continue to aim for progress in the game. Running not only gave me a reason to wake up each day (15 minutes before my alarm goes off) but also chaperoned humility in perspective. I am not the best runner, I have many more goals to achieve and many improvements to make in my form but I am the best that I can be right now . I am a 30-something, fiercely independent and gap-toothed smiling over-thinker, but first a humanitarian! I have a weakness for books and a superlative esteem for food & creativity. Superbly narrated! Keep conquering the distance!!! Very well written. Congratulations again! Hey Pratima, beautifully articulated and achieving a 2.15hr bang on the target on the maiden HM is commendable. Glad to read your story.